There is an astonishing amount of emotion wrapped up in a steam locomotive, especially now, when the few that still remain in functional condition are as scarce as condors. It’s difficult to put a finger on why they have found such a special place in our hearts, considering they are made of the same materials and work on the same physics as many other machines, but I’ve observed it to be the rule that most people regard steam with a mixture of awe and that tender fondness one might reserve for a favorite grandchild. Rule of thumb: Any vehicle that Di Caprio sets eyes on is doomed. Steam has long since faded, however, and I have witnessed that regret for its passing is often inextricable from an equally resentment of the diesel engines that replaced it. Many people express this in terms far stronger than simply expressing a preference for one form of technology over another, and the most vocal conceptualize diesel engines as if they were an calculated and malevolent intrusion into a long-standing and well order system. 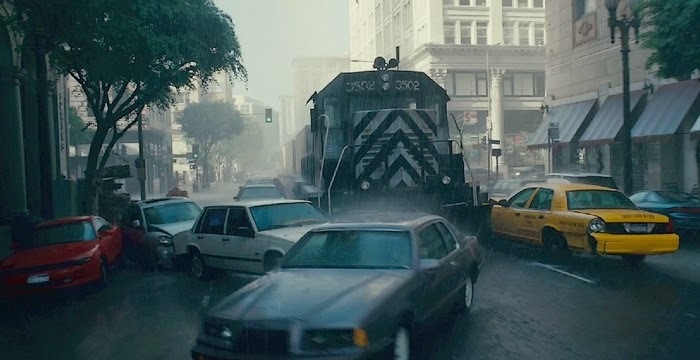 Even pop culture--think Thomas the Tank Engine, Inception, or The Dark Tower: The Waste Lands--appreciates that diesel engines make easy villains. This is, in my opinion, somewhat unfair. Abandoning steam was at the end of the day an economic decision, and diesel engines are by far better for the environment, safer, and easier for their crews to operate. Having a chance to experience the way steam locomotives work firsthand has been an unforgettable experience, but also made me appreciate exactly why the railroad companies turned to the alternative. it needed to be delivered, the crew routinely had to stop and service the engine. Despite this, the is general consensus that we as a people, lost something profound during the transition away from steam. That is plainly stated both in modern retrospects and in eyewitness descriptions of the technological change. What exactly faded away with the last columns of smoke, though, is hard to distill. Certainly, the end of steam stripped away a great deal of geographic familiarity. All of the water towers, coaling stations, and even the roundhouses themselves were slowly abandoned and replaced by more modern construction. The accouterments of steam rotted away and a sense of sterility settled in. The objects that once showed how the railroads had changed and conquered the natural landscape instead disappeared into it. This, though, does not provide context for the clear sense of anger that comes through when people discuss the end of steam. Neither does the tendency to express discomfort whenever any sort of new technology appears--the hostility toward diesel engines would probably have disappeared as soon as they became familiar, if that were the case. The aspect that I think does explain the intensity of emotion involved with the disappearance of steam is often mentioned, but rarely examined with the depth that it deserves: Diesel locomotives were pursued as an alternative to steam locomotives because they required far less maintenance. A busy Chicago and Northwestern roundhouse. In other words, a far leaner number of men was required to keep a fleet of diesel locomotives in daily service. 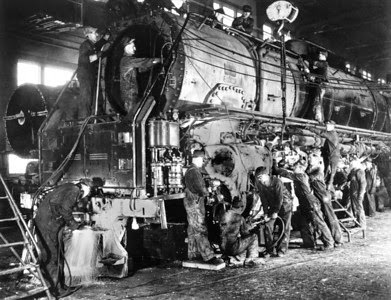 Steam engines were brought up to pressure over a period of a few hours and readied for daily service by a crew of hostlers--often the starting point for an individual who wanted to join the engine crew, could not physically be operated by less than two men, and were frequently cleaned, serviced, and repaired by specialized riveters, pipefitters, and boilermakers. Diesel engines, by contrast, could be operated by an individual and readied for service in a matter of minutes. 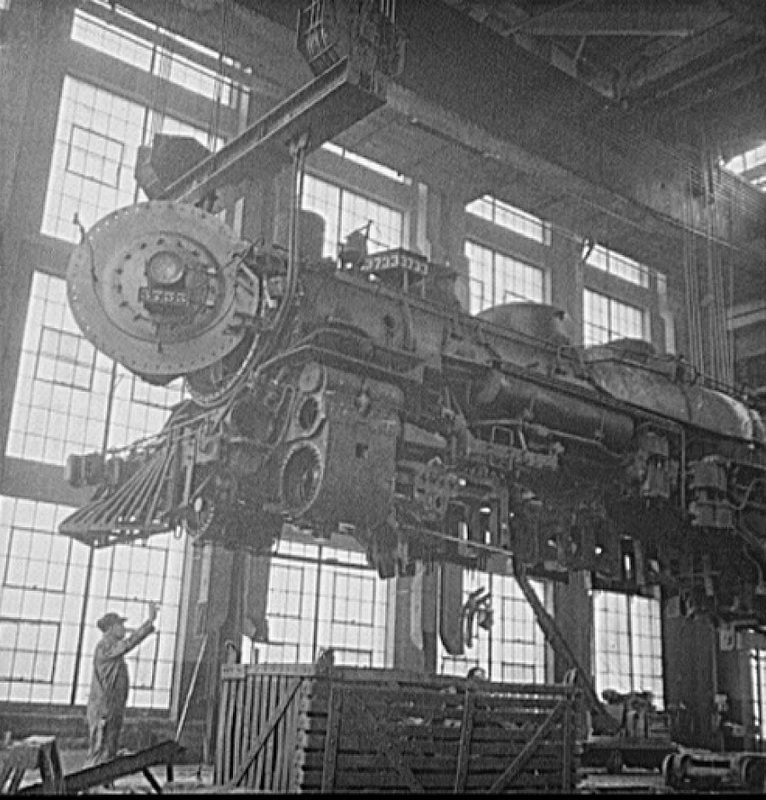 They could run far longer without having to be taken out of service for upkeep, and the only specialized craftsmen that they required--electricians--were not even required in great numbers in the days of steam. Lifting an entire engine during repair or construction. The possibility of dieselization had been hanging over the railroad industry since the 1930s, but was stymied by the Great Depression and then the need to earmark most industrial resources towards the war effort. After these delays, and the few diesels that were brought into service being mostly used for yard service, the change seemed inevitable,but distant. Two key cultural and industrial aspects hastened the arrival of the diesels. First, until the 1950s, refined fuels had been too pricey to be put into common use. The amount of fuel that a diesel engine consumed was so costly that on paper, they were often more expensive to run than a steam locomotive, even with their comparative lack of upkeep factored in. After the end of World War II, though, the military drawdown meant that much larger quantities of gasoline were suddenly available to the private market, at a much cheaper price than they had been in the pre-Depression era. A busy crew inspects an engine's insides. Prior to the end of the war, the only feasible means of long-distance travel was the railroads. The drop in fuel prices also had the effect of making other methods that had matured and been and mass-produced during the war--airplanes and automobiles--financially feasible for the use of the average person or family. 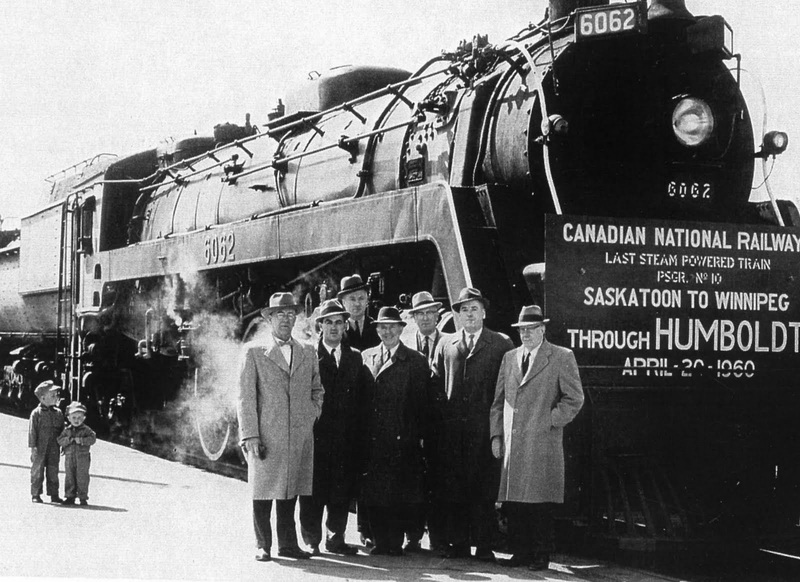 The railroads’ monopoly on passenger traffic and majority on freight service suffered significant losses. The rapidity with which diesel locomotives ended up over taken the steam-powered ones took many workers in the industry off guard. The shock was especially apparent in the United Kingdom, where steam was removed from the nationalized railroads almost overnight under the much-bemoaned Modernization Plan. A storm that the more astute among them might have seen on the horizon for many years had suddenly burst down upon them. As soon as the first diesel engines rolled into the roundhouses and the final generation of steam engines dropped their fires for the last time, thousands of jobs were suddenly rendered unnecessary. Adding insult to injury, the men who had previously worked in non-crew railroad positions had generally enjoyed steady work, as most of this work was performed on-site in the roundhouse or adjacent shops, instead of being outsourced to distant facilities, good pay, and union protection. 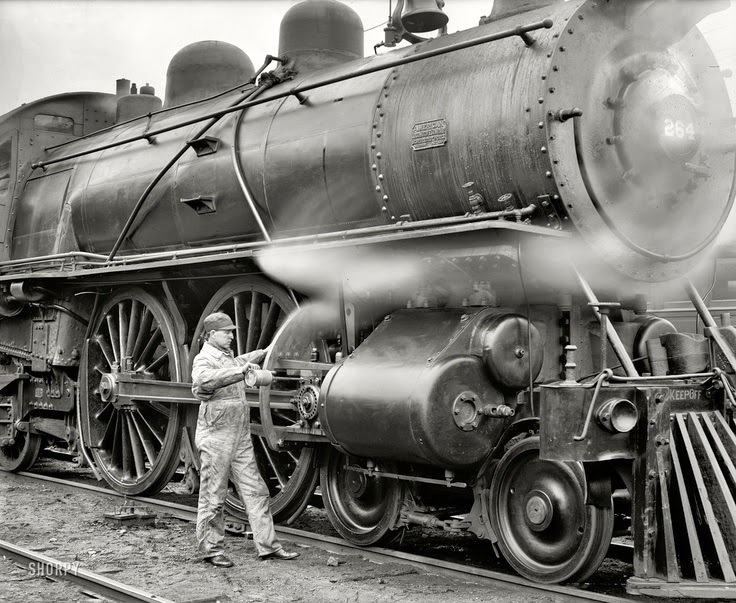 By and large, the railroads did not provide alternate positions for the people who had previously cared for steam engines, and other industries did not have enough openings to take in all of the men who had previously worked for the railroads. Considering that every person previously employed by the railroads would have pumped money into his local economy and would also likely have supported several other people, what resulted was a small depression, mostly confined to one industry. 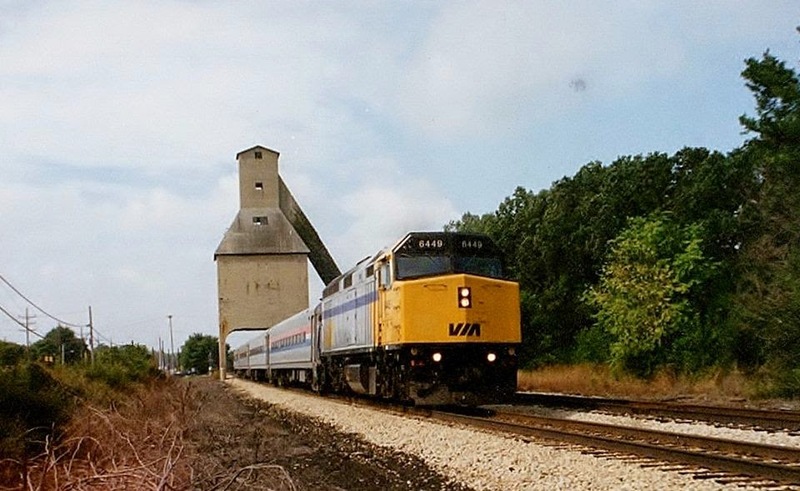 runs through a former coaling tower in 1995. It still stands in the present day. Viewed through this lens, the clear preference for one type of engine over the other is more than nostalgia, or one form of technology being by nature more relatable. The steam and diesel engines are, rather, symbols of personal worth and the loss thereof, of a cultural transition away from economic stability, of the waning need for one's hard-earned skills. 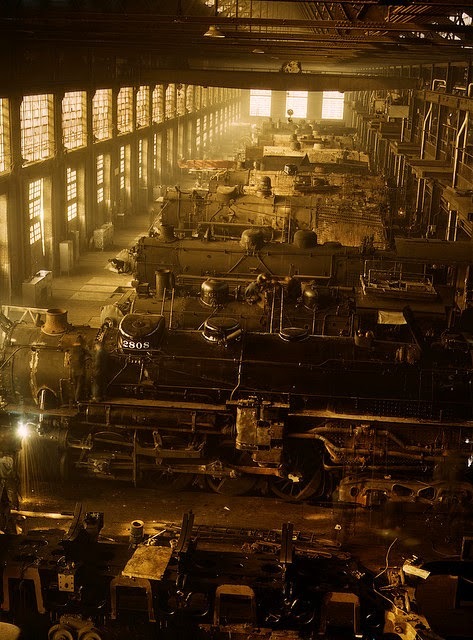 The sense of loss that so often permeates discussions of the end of steam is far more than sentimentality for the engines themselves: It is, instead, a eulogy for the lifestyle that was taken away from hundreds of thousands of individuals when diesel engines monopolized the rails.